Over the month of January I tried to focus my posts on healthier, lighter recipes. But with January safely behind us and Valentine’s Day less than two weeks away, I think it’s time to post a recipe that’s a bit more indulgent. Sort of like a reward for trying to eat so well in January. The other day my son mentioned to me that it had been a long time since I had bought Nutella and asked if I could buy some the next time I went to the store. Now, I love Nutella. I think almost anyone who has tried it would agree that it’s insanely delicious, but I try not to buy it very often. Mostly because I would consume the entire jar of it to myself if I could hide it from my kids long enough. I really like it a lot. Needless to say, I bought a jar of Nutella and then promptly tried to think of all the different ways I could eat it. You know, aside from the obvious, like on a spoon straight from jar. I’ve always loved chocolate and peanut butter together and the idea of combining Nutella and peanut butter seemed like something I should really explore. I’m so glad I did. 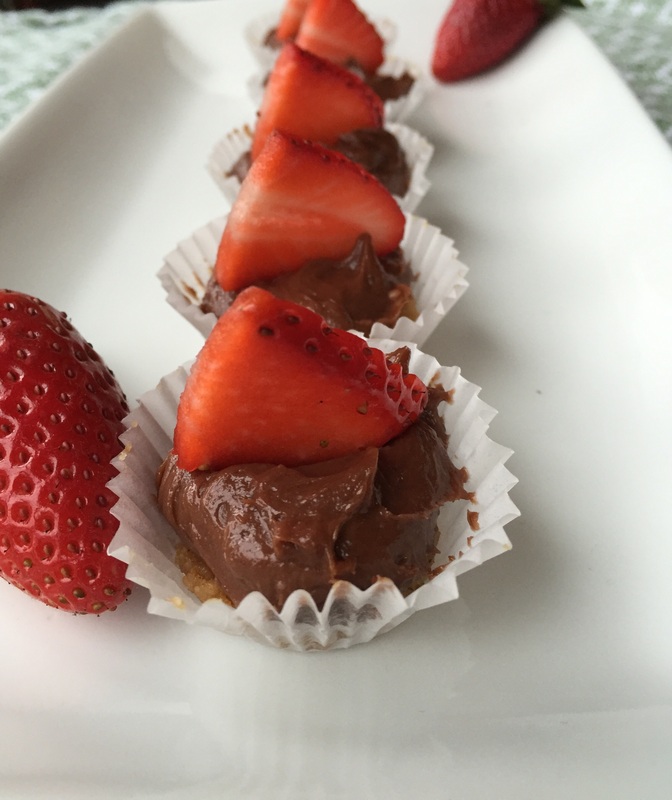 These Nutella cheesecake bites are very simple to throw together, but so yummy. They make 24 little bites, so you’ll be able to share with your friends, if you can bring yourself to part with any. I hope you enjoy them as much as I did. Lightly grease a cookie sheet (or line it with parchment paper). Mix the first 4 ingredients until well combined. Roll into 1″ balls and place at least 1″ apart on the cookie sheet. Press the cookies down lightly with a fork. Bake for 8 – 10 minutes until lightly golden on the bottom. Remove from the oven and let the cookies rest for about 5 minutes on the cookie sheet before placing them on a cooling rack. Once the cookies have cooled completely, crush 8 – 10 cookies until they’re finely crumbled. Melt the butter and combine it with the cookie crumbles. Mix well. Line a mini muffin pan with paper liners. Divide the cookie mixture evenly between the muffin cups. Using your fingers, press down and mold the mix around the bottom of the muffin cups. Allow to chill in the refrigerator for 1 hour until the crumbs have set. In a mixing bowl, beat all the ingredients together until smooth and well blended. Once the muffin cups have set, fill each one with about 1 tbsp of the cheesecake filling. Place them back in the fridge for at least 30 minutes until the filling has set. Top each with sliced strawberries right before serving. Oh wow they look so delicious!! Wow these look delicious, what an amazing combination of yummy things! Peanut butter, chocolate and cream cheese….how can you go wrong!! Yummy!! Who can go wrong with peanut butter, chocolate and cream cheese. Yummy!! What a delectable dessert! And so easy to make! Thanks for sharing! Thank you 🙂 They were very easy to make and came together much quicker than I expected. mm this sounds super delicious. Thanks for sharing this.